Jacksonville Beach Florida. The weather is great with a constant breeze that is relaxing. For many, this is their dream location to be right next to the water. You can enjoy a nice run on the sand, or grab a bike and head out for a ride. Living so close to the water though can raise a lot of questions. What kind of roof should you have put on your home when you are so close to the salt water of the ocean? When you are on the coast, a combination of wind, salt, and humidity will be working on your whole home. Homeowners should be forewarned; they are going to have to change out the materials on their home more frequently. If your area is prone to strong gusts and tropical storms, your roofing material will need to be heavier to withstand the force coming in off the water. The roofing material also needs to be tested by the manufacturer and come with some sort of warranty to guarantee it is going to hold up under pressure. Also think about salt. When you consider salt, it is usually used to preserve things, but when it comes to the home, it does anything but preserve your dwelling. Being right next to a salt-water ocean, you can be sure that regular materials used in the city are not going to cut it, since salt corrodes many materials including metals. Take for example galvanized steel. It is commonly used because it can offer at least 50 years of strong, affordable performance in a normal environment. This can be cut in half when it is a salt-water environment. To account for this, galvanized steel will be coated in liquid zinc. The zinc is placed on top to be sacrificed to the elements and take the brunt of the attack. Any zinc placed on top will corrode long before the elements get to the steel underneath, even if some steel is completely exposed. Homeowners in the Jacksonville Beach Florida area looking for a good roofer will find that many of their choices are quite a bit more expensive than roofing would be further inland. Galvanized steel for example is heavy enough to withstand the strong winds and salty air, but will be significantly more than asphalt shingles. Slate is another option that is considerably more expensive, but it boasts a long life in coastal areas and climates and has the added benefit of being invulnerable to rot. The natural stone material is heavy so it won’t blow away when the next storm blows in. Who can you trust to install these expensive roofing materials to protect your greatest investment? For an expert that you can depend on to install your roof right the first time, look to Taylor Made Roofing. The website www.taylormaderoofing.com includes information on a large variety of topics and experts are waiting to speak with you to provide estimates. 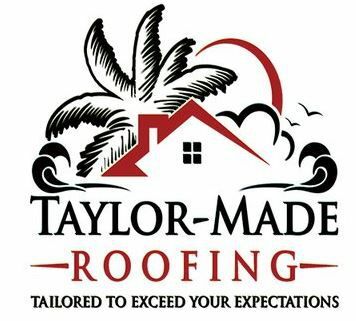 People looking to replace their roof in Jacksonville Beach Florida have consistently been happy with Taylor Made because they have lived in the area long enough to see what construction materials will still be going strong years from now next to the sand and surf. Come back next week for further coverage on great roofing for your dream beach home.